But, I think it’s important for parents and early childhood educators to know that basic computer skills and tablet skills are becoming a part of kindergarten readiness. The picture above is from my son’s kindergarten classroom in the Lake Washington School District (eastside suburbs of Seattle). 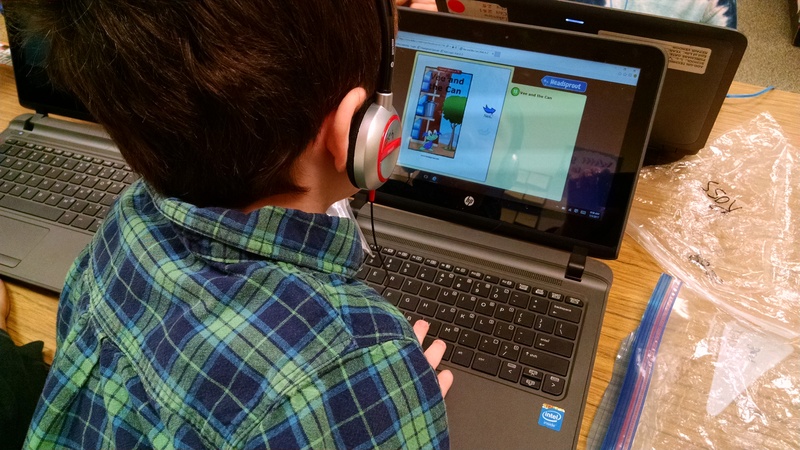 Every morning, during reading stations, one station is using computer-based reading programs, such as HeadSprout. They also use DreamBox for math skills. Computer-based programs are an engaging way to drill kids in some basic math and literacy skills. But only if the child knows how to use a computer. Today I watched several kids using the software with no problem, easily navigating use of the touchpad mouse, and the touchscreen, and understanding concepts like minimizing and maximizing windows, using their fingers to magnify an image on the screen, and so on. And I watched one child who lacked any basic understanding of how any of that worked. He poked randomly at the screen, getting random results – sometimes it worked, sometimes it didn’t. No real learning was happening during the almost 20 minutes he spent trying to figure out how the computer works. The learning value lost in that 20 minutes only puts him farther behind his classmates. So, if you have access to this technology at home, consider adding in some computer skill learning for your child at least 3 – 6 months before they start kindergarten. If you want recommendations and reviews for kids’ games and apps, check out Common Sense Media. I don’t think children need a lot of computer time – just enough to gain some basic skills and knowledge. The majority of a preschooler’s time should be spent engaged hands-on with their world, with time spent playing with open-ended toys, outdoor time, and free play time with peers. This entry was posted in Child Development, Early Learning / Preschool and tagged computer skills, kindergarten-readiness, screen time on January 3, 2017 by Janelle Durham. I wanted to write about the book Dot. by Zuckerberg and Berger. It’s an intriguing book that reviewers on Amazon either love or hate, and it inspires debate about the place of screen time in children’s lives. First, an overview of the book. This is a picture book for 3 – 6 year olds, with appealing illustrations, a charming main character (6 or 7 years old? ), and an engaging story line. But then Dot succumbs to a moment of exhausted ennui. Mom says “Go outside… time to recharge!” Dot sleepwalks out the door. She is bright, happy, and enjoying her time outside with friends. But she hasn’t completely abandoned technology – on the last page, she uses her phone to snap a photo of a friend, and another friend is using a tablet, as they swing, and paint, and play outside with their dogs. Multiple negative reviews talk about the unlimited screen time and the lack of parental supervision in the book. “I don’t know any 6 year old who has such free reign with so many tech devices and, even worse, goes unsupervised. Is this really what our world has come to? I think not, and the idea of suggesting something so absurd is upsetting to me.” It is true that we don’t SEE a parent in the book. But this is OFTEN the case with children’s books: as one commenter said “Where are Harold’s parents, for that matter, and why does the poor child have only a purple crayon? How could those Seuss children’s mother have left them home alone for the whole day, and didn’t she teach them NOT to open the door to strangers?” But it is the mother who intervenes and sends the child outdoors to play. So, clearly there is supervision and there are screen time limits. Other reviewers note that the character tweets and shares (presumably on Facebook) which are not typically activities that a 6 year old girl (like our protagonist) would do, and certainly not what a 3 – 5 year old (like our audience) would do. I was willing to let this slide, because of how they play with the words “tweet” and “share” later on in a different context. There’s others who feel like it’s an advertisement for technology – the author, Randi Zuckerberg is the sister of Facebook founder Mark Z. This is a cute little book. I’m not saying “wow, one of the best books I’ve ever read.” But it is a nice read, and a good basic summary of the need to find a balance between technology and outdoor / active / social play. It’s a good discussion starter. Some parents choose to strictly limit their children’s exposure to screens. If you’re a screen-free family (or very limited screen use), this is not the book for you. But if you are a family who uses a lot of technology, and tries to balance it with other opportunities, this could be a good book to share with your children about the joys of other types of play. You can check out my collection of Tips for Making Screen Time Work for Your Family. This entry was posted in Early Learning / Preschool and tagged children's literature, preschool, screen time on June 13, 2016 by Janelle Durham. Check out this helpful resource on Screen Sense – Research-Based Guidelines for Screen Use for Children Under Three Years Old. Avoid having the TV on in the background. Turn the TV off when no one is watching. Thought for the day, from a workshop based on the principles of RIE (Resources for Infant Educarers. ): the more active the toy, the more passive the child. An active toy that does something entertains – all a child needs to do is press a button and sit back and watch passively. A passive toy that doesn’t do anything engages – a child needs to be active to enjoy it. 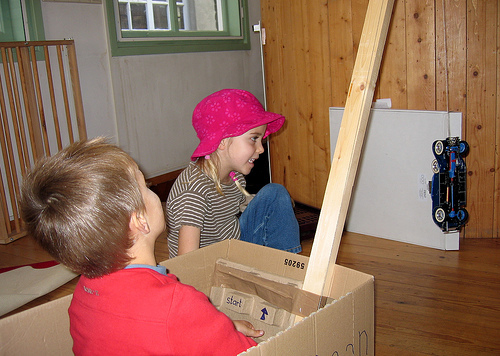 Or as Magda Gerber says about her recommended play objects – all passive toys: What do [they] have in common? None do anything. They will only respond when the infant activates them. In other words our active infant manipulates passive objects. In contrast, entertaining kinds of toys, such as mobiles or later on, windup toys, cause a passive infant to watch an active toy. This trains the child to expect to be amused and entertained, and sets the scene for later TV watching. Active toys also include: LeapPads, stuffed animals or dolls where when you squeeze their hands they sing a song… most things with batteries. But, I think the corollary to the statement of “the more active the toy the more passive the child” should be something like: “the more effectively a toy pacifies the child, the more actively they will protest when you try to take it away.” Silent Child turns into Wild Screaming Misery Lad when I then try to take the Kindle away, or when, god forbid, the battery dies in a public place. I do still use active toys (including the Kindle) at times, but I also try to balance them with a lot of “passive” toys – a lot of open-ended toys that encourage exploration and engagement. And I try to give him time – plenty of uninterrupted time – to explore them. Magda Gerber recommends (in The Best Toys for Babies Don’t Do Anything): balls, scarves, plastic bottle, containers (cups, bowls, baskets in many sizes and shapes). Or check out Geek Dad’s list: sticks, boxes, string, cardboard tubes, and dirt. And, of course, my favorite open-ended toy: nature. Read more about open-ended toys: Here are a couple posts from Mamas in the Making, which are about toys for the 3 – 6 month old crowd, but most of their thoughts apply through the toddler years: Our Thoughts on Open-Ended Toys and Age Appropriate Toys. Check out this video, or many of the videos on Janet Lansbury’s YouTube channel for examples of babies at play with simple open-ended items. Both at home and at work, I want to be sure there aren’t too many options for kids to explore. It’s great for kids to have some choices, but too many choices are stressful and overwhelming. When faced with too many choices, instead of engaging with one, kids may run from one to the next, never settling. Or, as someone said at my in-service yesterday: “If your child spends their playtime dumping all the toys out of the bucket, that means there’s too many toys in the bucket. Put at least half of them away for now, and the child will play more with what’s left.” Often, less is more. When we give kids the chance to really engage and explore open-ended toys, it’s amazing what they can come up with. Just for fun: Check out this blog post on Being the Cool Kids on the Block, which talks about saying yes to your kids’ play ideas (within reasonable limits) and open-ended materials. This entry was posted in Play and Fun Activities and tagged babies, Infant, Magda Gerber, nature, RIE, screen time, toddlers, toys on September 12, 2014 by Janelle Durham. Screen time no longer means just TV in the living room. We now have DVD players, computers and video games at home, and tablets and smart phones we carry all day everywhere we go. And kids get lots of screen time. Plan what your child views; preview what they use: Choose developmentally appropriate programs and tools that teach skills you want your child to learn and demonstrate values that align with your family’s values. For babies and toddlers especially, choose slow-paced shows and games, with calm backgrounds and without loud, jarring sounds and actions. Choose shows where the characters do everyday things that children do, like go to the park, take a bath, or spend time with friends at preschool. These shows may seem boring or goofy to you, but they engage young children without overwhelming them. Shows that focus on fantasy / unrealistic experiences (a trip to the moon or a superhero battle) do not engage the brain as well as those that involve everyday experiences familiar to your child. Pay attention to what academic skills and life skills are being taught and whether they are taught effectively. “Educational programming” ranges a great deal in how educational it really is. Use independent reviews and ratings such as Common Sense media to learn more before letting your child use a product. Choose the right tools: infants may respond best to touchscreen devices that let them learn hands-on. School age children may learn hand-eye coordination and decision making through video games, and can learn important school/work skills by using a computer. Tweens can practice communication skills with a cell phone. Facebook and other social networking are appropriate for teens, with guidance. It’s important to know what sites our children are using online, and what they’re doing there. Limit access to the Internet, use systems to block inappropriate content, know how to check the browser history (but don’t tell your child how to clear it!). Consider limiting internet use to public spaces of house, where parents can see / listen in. You may need to learn new tech skills to keep up with your child’s abilities. Use technology to your benefit: use DVR, on-demand or streaming TV to choose the best programming (rather than just watching what’s on at the moment), to skip over commercials, mute parts you don’t want your child to hear, or pause things to discuss. Watch out for apps with in-game purchasing! Some devices have systems which can block your child from spending money at least. But these games tend to cause addictive behavior and can lead to children who are very upset when you won’t let them purchase the next level. Although 40% of parents say they always watch TV with their child, many others report that they do not, because the whole reason they’re letting their child use media is so they can get other things done while the child watches! (AAP) But, when possible, watch with your child, play games with your child, or watch while they use an app. Co-watching give you opportunities to share your values with them. Talk about programs. Ask them what it was about, what characters they liked or disliked, how it made them feel, what choices the characters made, what they would have done in the same situation. Co-watching or playing games together helps us to connect with our kids. It’s another way to have fun playing together with something that captures their interest. Don’t feel like media is an essential tool in the education of your child. The best preparation for school and life involves you spending time with them, reading, talking, exploring things hands-on, and exposing them to diverse experiences. Children who live in households with heavy media use are read to less, and read less. Make a conscious commitment to read to your children more often. Even after they can read themselves, you can continue to read to them – choosing books that are a little above their reading level – or you can read a book together. When you are using media, tie it into real life. For example, if they see a TV show about an animal, go to the zoo to see that animal in person, paint a mask of the animal at home, go on the internet to learn more, and then pretend to be that animal. Eliminate background TV – or be conscious about your use. In addition to the times that children are actively using media (cited above), they are also exposed to background television – when the TV is on but no one is really watching it, or when a parent is watching TV while the child is theoretically engaged in other activities. Children between 8 months and 8 years are exposed to an average of 232 minutes a day of background TV. (http://pediatrics.aappublications.org/content/130/5/839.full) This media distracts the parent’s attention and significantly reduces how much time the parent spends talking to the child (and since a child’s vocabulary growth depends on interaction, this can cause language delays). It also distracts the child: 1 – 3 year old children have shorter attention spans when the TV is on, moving from one task to another quickly. Don’t eat in front of the TV. This unconscious eating may well lead to obesity increases seen in those with heavy media use. Do activities that you see on the screen: dance to the music, jump on the floor like the monkeys jumping on the bed, and so on. Do other physical activities while watching TV. Exercise? Stretch? Fold laundry? Internet access in the bedroom increases the chances of children accessing inappropriate content of all sorts. The presence of a TV in a child’s bedroom has been linked to obesity, poor performance in school, difficulty with sleep, and substance use. Teach that some times and places are OK for mobile device use, and others are not. Note: your children pay very close attention to what you do! If you tell them that they’re not allowed to use screens during dinner, but then you check your email or take a phone call during a meal, they won’t take your limit seriously. Teach your children to ask you whether it’s OK to turn on media. Privilege? Some parents find it works well to have media be a privilege that a child has to earn. For example, if they read for 30 minutes, they earn 10 minutes of screen time. Other parents are against this, fearing that then we’re setting up a value judgment that says reading is the boring thing you have to do so you can do the fun thing. Count total screen time: TV + DVD + video games + computer time + mobile device. Make sure that tablet time is replacing TV or other screen time, not displacing physical play, reading or other essential activities. Consider a screen curfew for the whole family – a time at night when the screens go off. We know that screen use (especially blue light from screens) too close to bedtime can disrupt sleep (see above). Environment: Set up you house so that the screens are off in a corner, or in rarely used rooms, versus lots of other options in plain view, easily accessible and ready to use. Have available: board games, art supplies, books, sports equipment, etc. Spend time outdoors with no screens in sight! Activities: Build into your routine plenty of other activities: sports and exercise, creative projects, household chores, social time with friends, and so on. Spend more time in unstructured play, which helps children learn to problem-solve and think creatively. Model good behavior. Turn off your screens or set them aside for a portion of each day. Model a balanced life of social time, physical activity, time outdoors, reading, etc. Have unplugged time. One author advocates setting aside “one hour per day, one day per week, and one week per year” when the whole family sets aside their screens. Design Tips: If you (or someone you know) designs apps for kids, check out Sesame Street’s great tips on how to build the best kids apps possible. This entry was posted in Child Development, Parenting Skills and tagged apps, kids, preschool, screen time, toddler, TV, video games on March 14, 2014 by Janelle Durham. We often hear about the downsides of TV watching for kids – aggressive behavior after watching superhero shows, short attention spans after watching fast-paced action shows, etc. Are there any benefits of screen time – time spent watching TV, playing video games, or using mobile devices? Educational media can expose children to the broader world far beyond their community: they can learn about exotic animals, historical events, a wide range of musical and artistic styles, diverse cultures and lifestyles, and scientific concepts like interplanetary space. Story-telling, whether in books or video, allows children to experience social interaction and emotional challenges vicariously. Watching characters interact positively can teach manners and social graces. Watching a character deal with grief can help a child learn to manage it. Media can also teach basic academic skills like ABC’s and counting, and help children memorize basic facts, like the order of the planets or the order of the colors in the rainbow. The kinds of skills that can be learned by drilling with flash cards can typically be learned in a more engaging way with media. Also, the majority of the research has been done on children age 2 to 8, focusing on television viewing. There is very little research showing benefits of media for children under age 2. There is also very little research on the modern experience of highly interactive touch-screen apps, though some theorize that these will be more effective “educators” than a passive screen experience. Parents also use screen time as “company” for themselves. Spending all day at home with a small child can be very isolating, and having the TV on in the background or checking Facebook can reduce the parent’s loneliness. Listening to a podcast or reading an e-book can provide some much needed mental stimulation in the midst of a day filled with finger painting and Dr. Seuss. Again, the majority of the research is on kids 2 to 8 years old, and on television viewing, but much of it may also apply to younger children and/or other media. Television has been linked to obesity, sleep issues, aggressive behaviors, and ADHD. Early TV viewing is correlated with (i.e. doesn’t necessarily cause, but is related to) deficits in executive functioning – attention, memory, problem solving, impulse control, self-regulation and delayed gratification. Children younger than 2 who watch more television show delays in learning language. Research may not show this specifically, but anecdotally, teachers report that children who use media often become passive, lose creativity, and forget how to entertain themselves without a screen. Amongst 8 to 18 year olds surveyed, heavy users of media and moderate users when compared to light users (less than 3 hours a day) were: less likely to get good grades, more likely to say they have a lot of friends, less likely to get along well with parents, less likely to be happy at school, are more often bored, more often sad or unhappy, and report that they get into trouble a lot. It may not be that media itself is harmful – some of the issues may be what kids miss out on when they spend time on screens. One study showed that for young kids, every hour of TV time meant 50 minutes less per day of interaction with parents and siblings and ten minutes less of play. (cited in AAP report) We know hands-on play, human connection, eye contact, and interactive conversation are essential for learning many skills. When children are on screens, they simply get less of that. When parents are also engaged in their own screen use, this further limits interaction. There are plenty of articles and opinion pieces bemoaning the sight of parents looking away from their child’s eyes and into their IPads. There are also plenty of blog posts from parents defending their right to take a sanity break now and then, and defending their need to distract their child while they tend to the business of the day. Both sides have good points – and both sides may be more strident than they need be. As with many things in the life of a parent, we need to find our own way, thinking intentionally about our priorities, and striking a balance that works for our family. See here for tips from parents and experts. This entry was posted in Child Development and tagged apps, parenting, preschool, screen time, toddler, TV on March 14, 2014 by Janelle Durham. 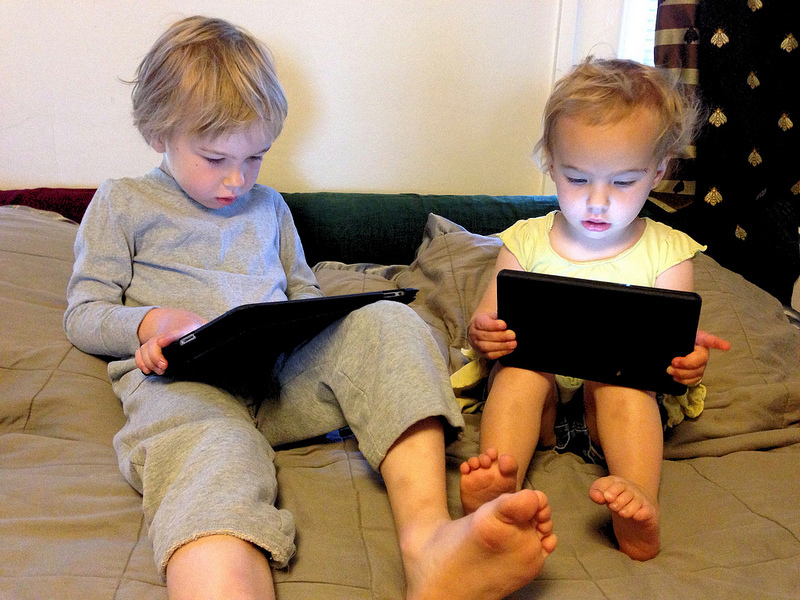 Screen Time for Parents and Kids – How Much is Happening? For decades now, doctors, teachers, and developmental psychologists have been warning about the perils of TV viewing for children. Parents often feel guilty about letting their kids watch, but nevertheless continue to do so. 58% of kids under 8 watch TV at least once a day. 14% of children 6 – 23 months old watch two or more hours of media a day. A third (36%) of all kids have a TV in their bedroom. Over the past few decades, we have added many more screens into the mix. Children 8 and under now average 2 hours a day actively using a screen: 50% of that time is watching TV, 19% watching DVD’s, 13% using mobile devices (tablets or smart phones), 10% on computers, and 9% on video game players. Children 8 – 18 average 6. 5 hours of screen time a day (more time than they spend in school) and much of that is media multi-tasking – texting while watching TV, listening to an IPod while working on a computer, etc. The biggest change in recent years has been mobile devices. In 2011, half of children had access to one. By 2013, three quarters did. 72% of children under 8 have used a mobile device for playing games, watching videos, or using apps. 17% use them on a daily basis. 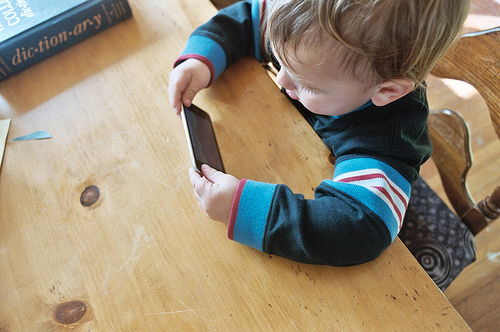 Even amongst children under 2, 38% have used a mobile device. Given that screens are such a huge part of modern life, it doesn’t make sense for educators to preach a “just say no” attitude toward screen use for children. Instead, we need to think about using screens consciously, aware of the benefits and risks, and keeping in mind our long-term goals for our kids. This entry was posted in Child Development and tagged kids, preschool, screen time, toddler on March 14, 2014 by Janelle Durham.